"Italian men's shoes: how to start a shoe business." “I would like to set up a shop of handmade shoes”. Enzo Bonafè’s answers and professional advice. We well know that generation gaps have always interfered in the sharing of dreams and goals between parents and children. In the last years, even the technological development of communication systems and the new market globalization have contributed to the inevitable change of food and services distribution channels. For these and further reasons, some businesses have resulted to be less interesting for young entrepreneurs, who prefer to switch to different businesses, very far from the tradition of handmade manufacturing, for example, because old business seem to belong to a old slowly vanishing world. However, facts give the lie to general groundless ideas. As Silvia Bonafé confirms, the current technological progress and all global factors that drive people towards new worlds often cause the disappearance of traditions and of “what seems to be too old”; but meanwhile, in the same changing process, old traditions acquire a higher value thanks to their unique traditional nature. Technological progress has brought to the development of new professional profiles and consumers: there are often young entrepreneurs and managers holding a higher purchasing power. That is why, in all European countries we witness the merging of completely new consumers, who are used to travel and get in touch with different cultures or lifestyles. This analysis brings to an important consideration concerning shoe manufacturing and retailing. The current buyers of high standard shoes are not only the important professionals as in the past, choosing their favorite shoes in a limited range of products. Nowadays, the new Italian and foreign entrepreneurs have a different lifestyle: they can buy expensive products and decide to choose the Italian handmade products because they have learnt to appreciate the outstanding quality and exclusivity features. On the basis of the above observations, we deduce that in the present business world characterized by the mass large-scale distribution of products, a shop of high-class men shoes can meet the requests of a niche diversified and group of wealthy clients. Today, these clients move quickly from one place to another by plane and surf the Internet to find out new lifestyles, products or services. The modern clients usually have much more money; they prefer branded products and can buy them in far places just in a few minutes. Many Italian business tycoons are used to move from their Milan or Turin office to go to Naples, where expert Masters of the best Italian hand crafted tailoring make customized shirts for a reduced favorite group of worldwide entrepreneurs. We got to the second meeting with Silvia and Massimo Bonafé, the current owners of the world-famous brand “Enzo Bonafé” of Bologna, specialized in the production of handcrafted men shoes. During the last interview, we decided to define a general outline about the shops of classic men shoes and their successful features. Where should you set up a shop of handcrafted shoes? “From our experience, the location of a shop with international clients is not crucial. The global market makes different conditions compared to the traditional one. As a matter of fact, in relation to the country or culture the distribution system takes diversified features. In Japan or Russia, our shoes are also sold in the most popular big shopping centers, because in these countries the role of shopping centers or malls is completely different from the Italian one. In Italy, France and in the main European countries, the brand Enzo Bonafé is displayed even in less central locations like tourist small villages or small towns easily accessible from larger cities, but not in a central crowded location where you can usually find the most popular shops. This means that Enzo Bonafé’s shoe retailers are located both in small towns and in big cities or in the prestigious shopping areas of the world. Our shoes are sold in the most exclusive shops of Milan, Monte Carlo, as well as in small province areas where we have got the same kind of demanding clients. All our clients are usually totally fascinated by tradition and prefer the more direct and personal relationship with the shop assistant or shop keeper and the manufacturer; at the same time, the manufacturer is always ready to assist the client in case of special requests like customized changes or adaptations. The choice of the suitable location to set out an exclusive shoe shop depends on the country, the culture of clients, and the shopping tradition of every place, as well as the changing needs and requests of the growing markets. To sum up, I would say that for some clients the purchase of handmade shoes is a kind of rite and the shop location is almost never important”. 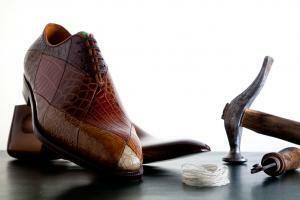 What does a handcrafted shoe shop of quality offer to clients? Apart from the direct personal relationship just mentioned, the traditional shop of exclusive handcrafted shoes offers the unique care for details and the possibility of modifying each item in relation to clients’ needs. The people who come into a shoe shop and find the shoe brand Enzo Bonafé know that they are going to buy mainly the quality of Italian tradition and craftwork, the guarantee of rare materials as well as a wide range of assistance services they wouldn’t find elsewhere. Even for this reason, Japanese, Russian and all foreign clients get literally fascinated with the beauty and uniqueness of products, because in this specific field, where you find the utter quality of shoes, the Made in Italy products defy all competition. In the last years, the shoe market has changed but we have decided (even in less favorable times) to keep faithful to craftwork tradition. Today, we are happy with this choice of tradition and quality to avoid any mass market or distribution, even if in the past market trends showed us contrary ways to follow. Our company has been rewarded thanks to its brave choice of defending identity, staying out of mass markets or brands which don’t share the same values belonging to our craftwork and manufacturing of high class customized shoes. In the past Bonafé relied on tradition and quality and today we are still relying on the same values as our retailers do in Italy and worldwide. It is sometimes quite difficult to defend the excellence of quality and the niche market, because nowadays many companies propose cheaper products which seem to be similar to ours, however, in the end the most demanding clients recognize our fairness and care in giving exclusive products and services. As concerns the available services of a shoe shop, they depend on the shop keeper goals and his desire of including the sale of accessories or clothes. Anyway, it is important to say that the sale of high-class shoes demands a special care and commitment in hard working the whole day to guarantee maximum customer care service. As I told you before, the retailer of high-class shoes must not think about his business as if he had only to wait for clients. On the contrary, our retailer must take part to meetings, events, important occasion in order to increase specific interpersonal relations; to some extent, the retailer seems much more to a manager or entrepreneur, different from the common seller. His main sale goal must be based on the complete satisfaction of clients’ needs and requests in order to be competitive as high-class shoe shops. Who decides to set up shop of handcrafted shoes? Who are your retailers? What experience do they need to set up an exclusive shop? Enzo Bonafé’s handmade shoes stand out in the most exclusive boutiques where clients look for details, comfort, the best classic ageless design. Our retailers offer classic men shoes for special occasions, designed for managers, elegant men who demand both style and comfort. To buy a pair of handcrafted shoes means to have always your beautiful and comfortable shoes for any special occasion. You never get tired of wearing this kind of shoes because they are custom made, your ideal Shoes, showing a special classic elegance which stands out among thousands of changing fashion products. Bonafé’s retailers are usually fashion and sale professionals who know how to set off the products and give clients the best advice. They don’t often need any particular training – Silvia Bonafé says – because the retailers who want to sell our shoes usually know us, our work, and the value of our shoes and services. Of course, if you decide to set up a high-class shoe shop, you must know how to advise all clients and remember that you have to establish a special personal relationship based on confidence. Secondly, if you decide to become a retailer of men shoes like the ones manufactured in our factory, you should love shoes in general and have a deep knowledge of men feet anatomy and the stress or efforts feet make during the day. Further, you should know the different materials and leathers used by Bonafè. This knowledge allows you to play your cards right when you have to describe the exclusive features of each products or advise clients about the leather to choose.